Australian banks are upset. Their $30 billion per year gravy train of profits from the Australian people is finally being slowed down. A levy on bank liabilities of 0.06% annually was announced as part of the 2017 Federal government budget, and is expected to raise about $1.5 billion per year, or 5% of bank profits. To be clear, the banking system is a regulated cartel. Its primary function is to provide a public good in the form of the money supply of the country. As such, we would expect it to be uncompetitive, and use tight regulatory controls to ensure that the privileged position of private banks is not being abused. In my book, Game of Mates, I explain that the result of this uncompetitiveness and lack of adequate regulation in Australia is that over half of the banks' profits can be considered economic rents, which could be taken back with better regulation and shared with the public at large. After reading today about how home buyers need to save over $500 per month for 10 years for a deposit in NSW and Victoria, I thought I would republish the below post of mine from January 2010 about the impossibility of saving a deposit in a market with rising prices. Baby boomers and older generations often cite high expectations, and the inability to save, as the main hindrance to the younger generations’ ability to buy their own home. They go into great detail about how much it has always been a struggle to buy a home, and that if young people decreased their expectations and bought something small they could work their way up the property ladder. I am one of those generation Ys looking to buy my own home, and from this perspective, it is not quite that simple. 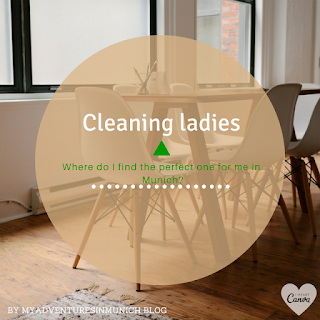 Today I want to tell you about hiring a cleaning lady in Munich. Why? because to find the perfect one could be more painful than to find an affordable apartment in Munich. In this blog post I will tell you about my experience with some of the cleaning companies you will find online and I will also include some links to learn about the tax deduction you can claim if you hire cleaning services in Germany. Let me start by saying that the cleaning ladies, maids, housekeepers, housecleaners... whatever you call them aren't expensive in Munich. The rates of some cleaning companies in Munich start at 16-18 EUR/ hr. Back in 2015 I signed a contract with Karos Reinigung for a biweekly cleaning service of 3 hours. The previous tenant of my apartment used to work with them so when I moved in, I decided to try them. The rate was 16 EUR/ hr (plus VAT which in Germany is 19%). I provided all equipment and cleaning products.